We are HUGE fans of Halloween. Perhaps it’s the smell of pumpkin spice in the air, or maybe it’s the promise of candy at the end of the month. 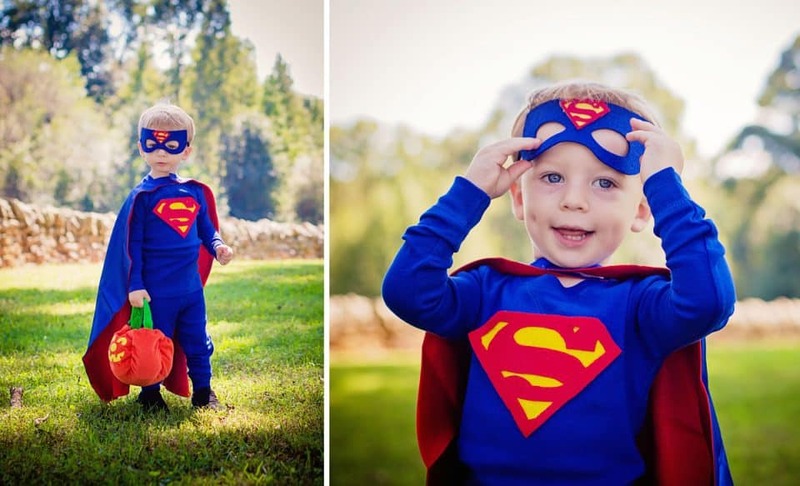 Either way, we’ll take any excuse to dress up the kids in super cute costumes and take photos. That said, we cringe at the thought of going into one of those Halloween stores and spending our hard-earned money on pieces of disposable clothing (at least until the end of season when we’re all looking for some cheap dress up clothes for the kids to play with the rest of the year, right?). 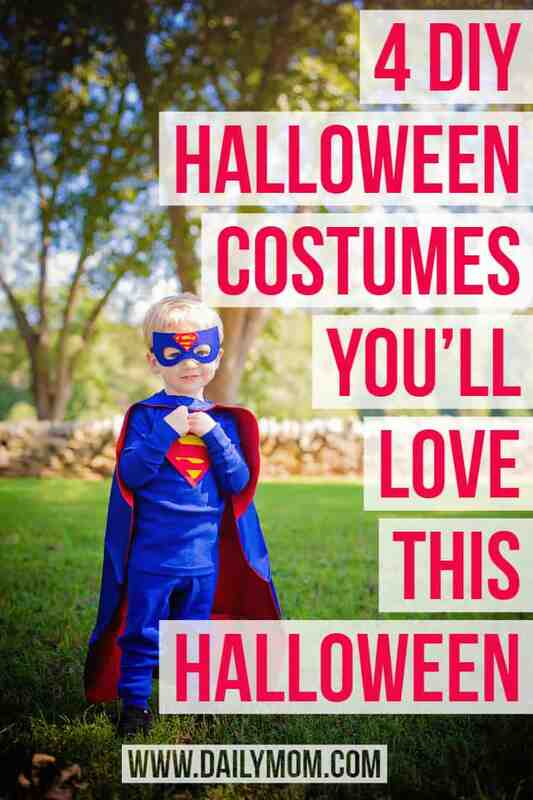 Granted, we also hate the idea of spending a ton of money on a higher-quality costume from a boutique shop. Because, let’s be honest – if it’s that nice, that outfit is getting sealed back up in whatever hang bag it came in and put into storage for safe keeping. Maybe our grand kids will wear it again, or not. Wouldn’t we all prefer to spend money on pieces of clothing that can serve multiple purposes? And that my friend is why we love DIY Halloween costumes for kids. Whether you’re the type that likes to plan ahead, or you’re a last minute kinda gal with limited time and supplies, Primary.com has colorful basics that serve as a wonderful baseline to make the perfect Halloween costume. In fact, we took four of their basic pieces to create these super simple and fun costumes. A couple of years ago, one of the kids received a dress-up kit from Props in a Box. This particular kit included pieces to become a dinosaur but lacked a solid base. 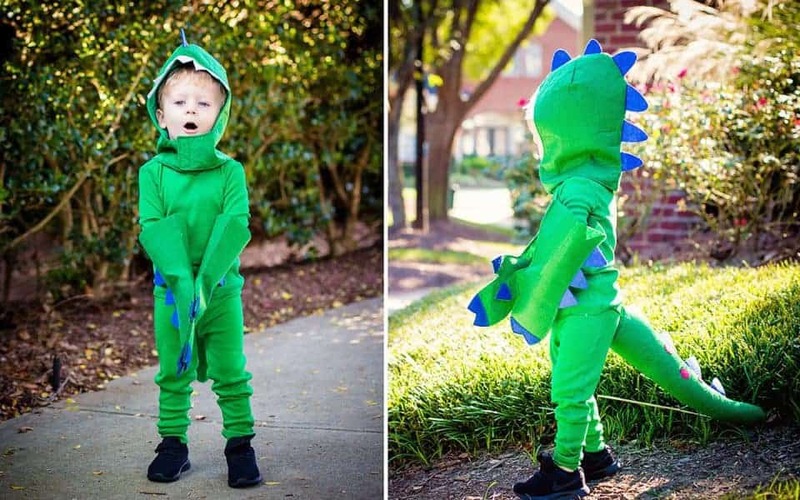 Soft, tag-free green pajamas were all we needed to turn our son into a roaring dinosaur! Don’t have dinosaur arms, headpiece or tail handy? No worries. Here’s an alternative way to create a similar look. If you go the lazy route, as we did, then at the end of the night you can simply take off the extra pieces and tuck your kid into bed. Comfy pajamas for the win! In the spirit of staying comfortable and saving the world, we decided to tap into our inner superhero. Once again, we built on pieces we already had in our dress-up box. For the cape (in case you don’t already own a cape and mask): Cut a large rectangle from red felt and safety pin it to the back collar of the pajama top. For the S emblem: Find the Superman logo on the internet. Cut and trace the emblem onto to red felt, and cut a matching yellow diamond-shaped backing for the S. Hot glue together and attach to the front of the pajama top with fabric tape. For added effect, use red electrical tape to add a belt (not pictured here): Make the diamond shape for the center of the belt. Use the same tape around the pajama pant waist to make the rest of the belt. 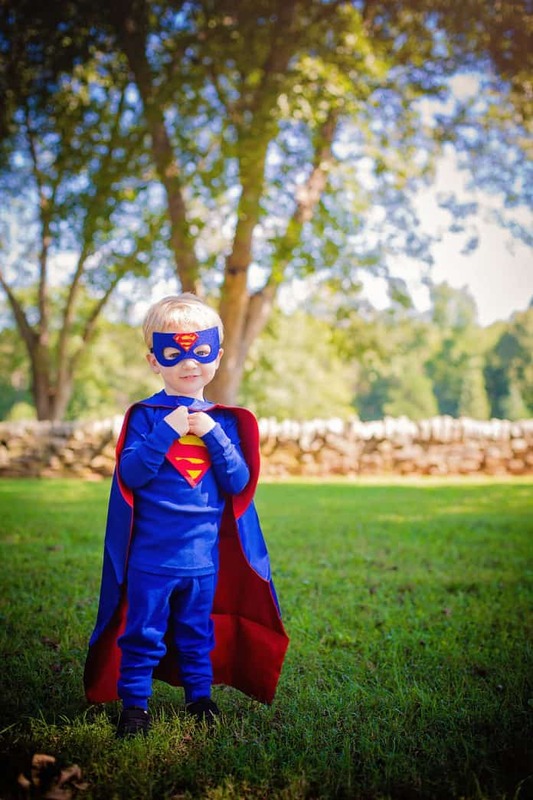 If Superman isn’t your child’s favorite superhero, just choose the appropriate pajama top and bottom colors to go with your cape and mask. Sometimes a piece of clothing is just begging to be used for Halloween. 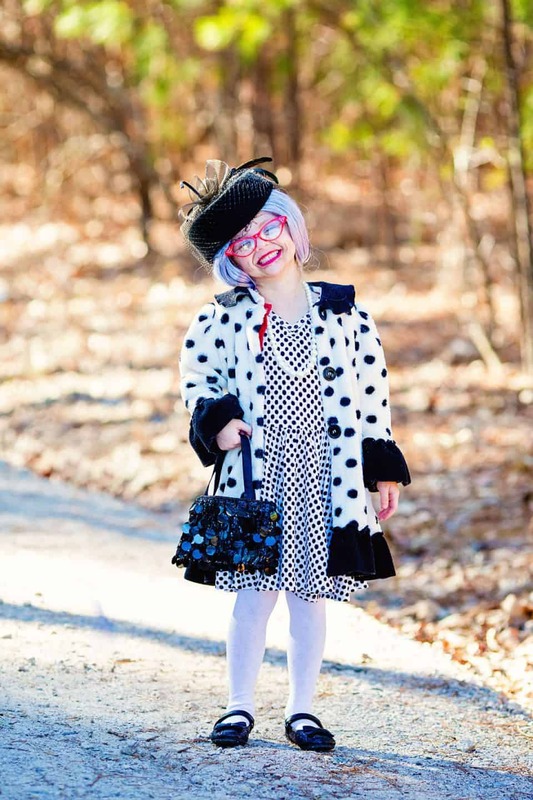 For example, this black and white spotted coat has been our go-to for a number of costumes over the past couple of years, including its most recent use on the 100th day of school as this 5 year old transformed into a 100 year old lady. 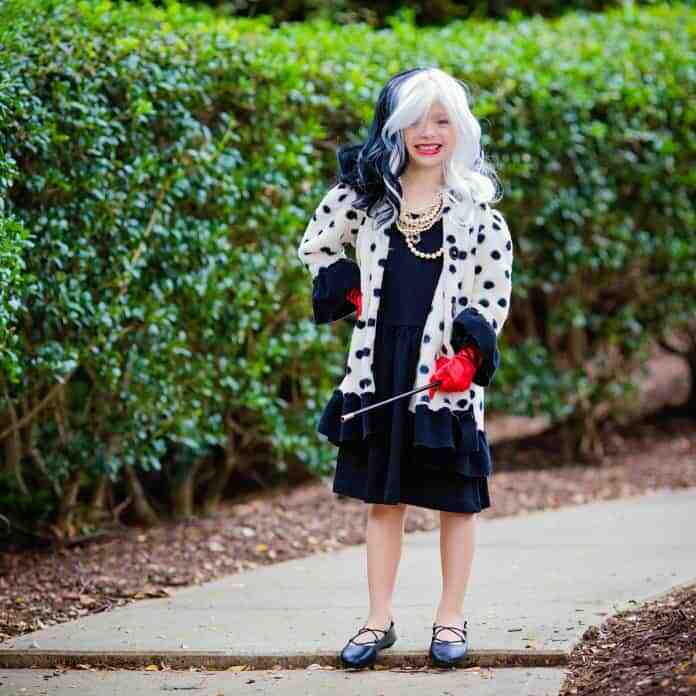 Before she outgrew the coat, we decided that she should become Cruella Deville for Halloween. 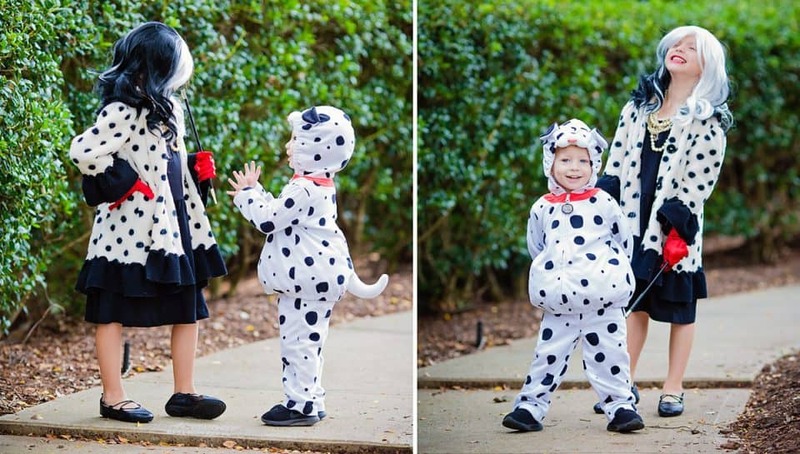 Of course, it seemed only appropriate for her little brother to become a dalmatian puppy. 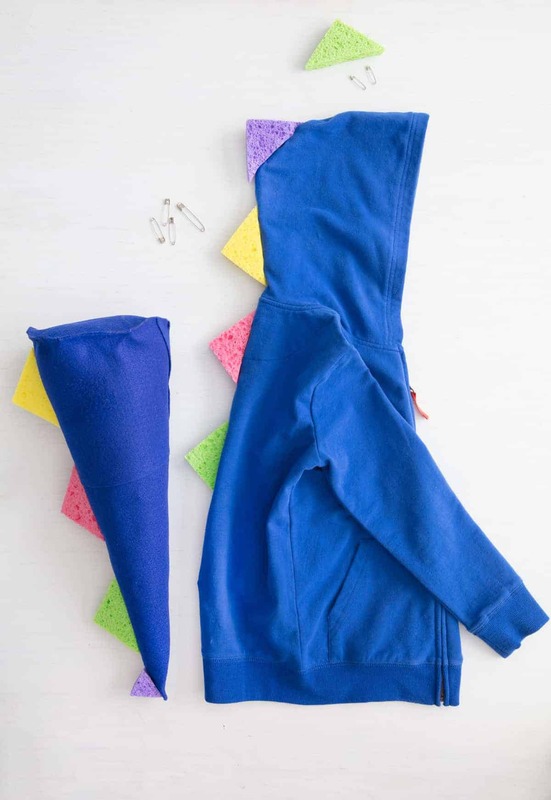 Of course, not everyone has a black and white coat, but part of the joy in making a DIY Halloween costume for your kids is utilizing materials you already have to create something unique. 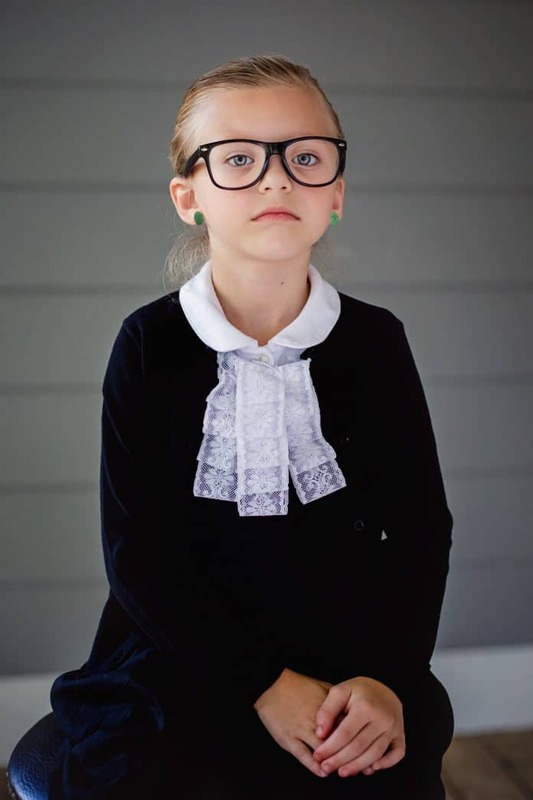 Speaking of unique, how about a Justice Ruth Bader Ginsberg (or any justice) costume? We love the idea of choosing political or pop culture related costumes. 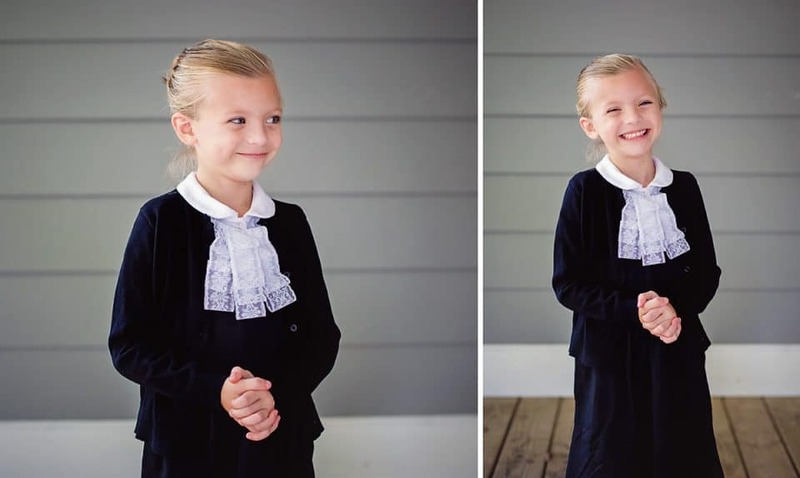 While Justice Ginsberg may not have had her life on trial in the recent weeks, dressing as a Supreme Court Justice will most definitely catch homeowners off guard on Halloween night. It can later be used for “Career Day” at school. For the lace jabot: Fold a length of white lace fabric into a rectangle and safety pin it to inside front collar of the polo shirt. Accessories: Glasses, clip on earrings, hair slicked back into a bun, and a deadpan look. 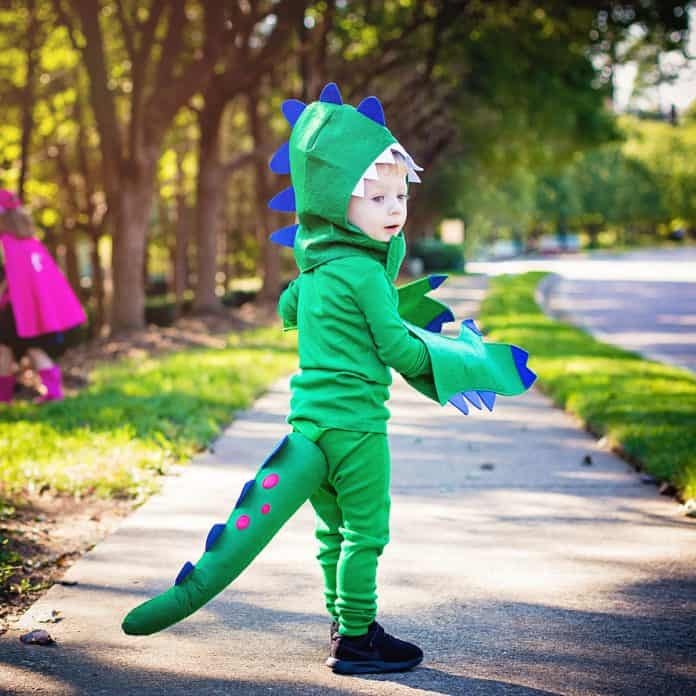 DIY Halloween costumes for kids can be as easy or complicated as you want. All it takes is a little imagination and crafting skills, and you’re sure to create memories for your kids that will last a lifetime. Happy trick-or-treating! Looking for more Halloween inspiration? Check out these Last Minute DIY Halloween Costumes.